A lettings trade body says 380,000 landlords may be about to sell at least one property - potentially flooding the sales market. 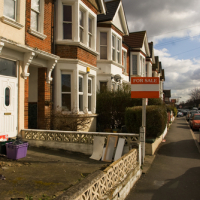 The National Landlords Association says this is 19 per cent of all landlords; of that number, almost half say that within a year they are likely to sell a flat and another third likely to sell a terraced house. Both these property types are typical first time buyer homes and the NLA says this is good news for that sector of purchaser - even if the glut may not help keep prices buoyant. Significantly, just seven per cent of landlords who plan to sell say they intend to sell to other landlords. Richard Lambert, NLA chief executive, says: “These findings sound like positive news for potential new homeowners, but the reality is not everyone wants, or is in a position financially, to buy. “In fact, if all these homes are sold as planned then it will lead to a significant fall in the supply of property available to those who choose to rent, or have no other option but to rent”. The association says it has been looking into the issue recently and has produced a video and discussion paper – called The Hustle For Homes – about the relationship between landlords and first time buyers in the market. “Everyone seems to have a gut instinct about the extent to which they feel landlords and first time buyers compete for homes in the UK, but homeownership is a highly emotive issue so the facts are often overlooked” says Lambert.